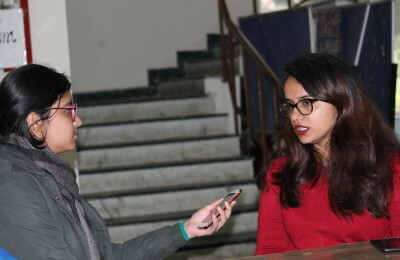 Aanchal Aylawadi who is currently a student at Mata Sundari College is a magician and believes that magic is a way of challenging perceptions and not accepting what is handed to you. Magic has always been considered mystic in India and people who were experts in magic never really shared it with anyone, either they gave this art to their family or they died with all the secrets. Aylawadi questions after all her performances, “Is it real or dangerous or can I do it? What if it turns the other way round?” To her, the ultimate act of magic is to create something from nothing. As every other child, Aanchal used to get very much amazed by her father’s “Dove Production Magic”. She always wanted to learn that but he never used to disclose any secret for her curiosity to know them. In fact he wanted her to understand its value and respect the art hidden inside. “I still remember the day he finally shared with me the secret of producing a dove out of a balloon. :, she says. After waiting for a lot of years she could understand the role of patience in magic. Being a student of her alma mater DAV Public School Sreshth Vihar and Mata Sundari College for Women, University of Delhi, she used to perform for her batch mates and teachers. Magic instantly made her a star; solely because of uniqueness of this art. She says that whatever she is today is truly because of her father and brother who made her evolve as performer. Recently she hosted and performed at Merlin Award Ceremony. What Oscars is to movies, Merlin is to magic. It was a proud moment for her dad Magician Rajkumar and his team as he was awarded with this prestigious award by the president and founder of international society of magicians for his outstanding contribution in the field of magic. She finally says that magic has been an integral part of her life since her childhood. She believes that her magical journey has just begun and she is excited about the future; possibly showcasing in the University itself!